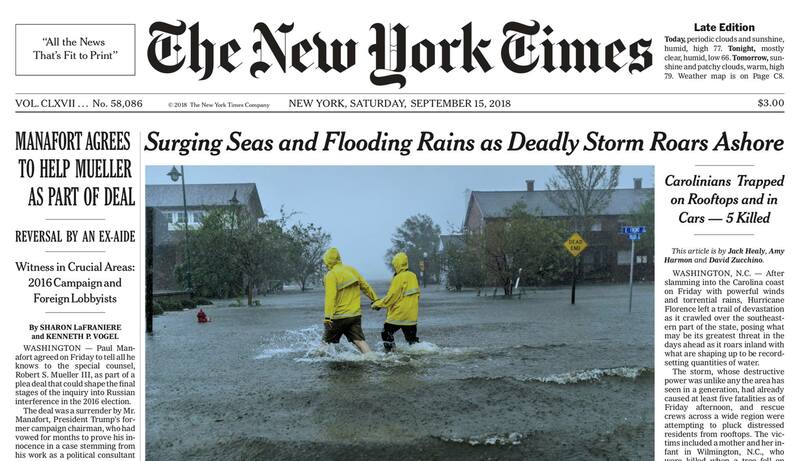 This is not how I wanted the corner I live on to make the front page of the New York Times. My house is just to the right of these folks. This is for my folks and friends that don’t live near. We are always reluctant to evacuate because it can be hard to return. When a hurricane strikes and you are by the water, first the water is pushed in (if you are in the NE quadrant like we were for Florence – the absolute worse position to be in in a hurricane), causing flooding from wind – which is what affects my particular location, then when it goes by then the water goes down but the rain inland causes the rivers to flood away from us cutting New Bern off. We may be high and dry by then but we can’t get back home. That did happen from Florence but we threaded the needle and got home before we were cut off. Then by the end of the week even Hwy 70 was back open. However it was another week before you could travel south on 17 because the bridge in Pollocksviille was severely damaged. Anyway I got home and for the first time I almost cried, I could not get my key in the front door. No locksmith answered their phones. I didn’t have a key to the other doors, the electricity was out so I could not get in through the garage door. Spraying air into the lock did not help. My neighbors Kim and Steven Wynn came to the rescue, Steven came with a spray bottle of water and finally got the key in the door. It took some strength but the door finally opened and we went in. What a mess. You can see where the waterline was. Lucky or good planning that the electric recepticales are higher than the 4′ of water. Everything was covered with muddy slime. Unfortunately only one of my work tables was high enough, The things I put on top of all but one of them got wet – 85% of the stuff below the water line was ruined. Tools rust within a day or two of being submerged, I didn’t know that. The real heart breaker was the kiln room. Somewhere is this mess is 3 kilns blown apart. Usually when we have a hurricane the water rises slowly. I expected that to happen this time, instead we were hit with that storm surge they always talk about, that we haven’t had, or at least this much, in the 29 years I’ve lived here. This time the 4 feet of water that came into my house all came at once, like a wall, with waves on top of it. And the fact that it moved so slowly allowed it to pile up much more water than it would have if it was a fast mover, like Michael that just hit Florida. This was all within a block of my house, areas like Fairfield Harbor and River Bend had a lot of flooding as well, more than has been seen in decades. We are now a few weeks past Florence, and if you drive around New Bern you’ll still see some piles of peoples belongings along some roads, you’ll see some broken trees and some blue tarps on some roofs, but most of town looks normal. We are so grateful that we didn’t get hit like a 4 like hit Mexico Beach, and completely wiped them off the map. I’ve never been told to evacuate before. It was odd (after trying to move stuff out of the way of flooding) that as I looked around as to what I needed to take with me, I thought, it’s all just stuff. An interesting feeling. I didn’t want to leave but didn’t know what else to do. So headed north. I-95 was busy but traffic moving well to Richmond. Stopped for a break at the Lewis Ginter Botanical Garden (which is on my list for a potty break every time I pass through). Was just going to peek out the window, check out the gift shop, and then be on my way. Noticed there was an interesting looking garden sculpture, looked like origami, metal sculptures by Kevin Box, my friend stopped at the desk and asked about them. She also mentioned that we were evacuees and one of them gave us free passes and said, “go in an take a look” – wow! These gardens are in my top 5 favorite Botanical Gardens in the country. 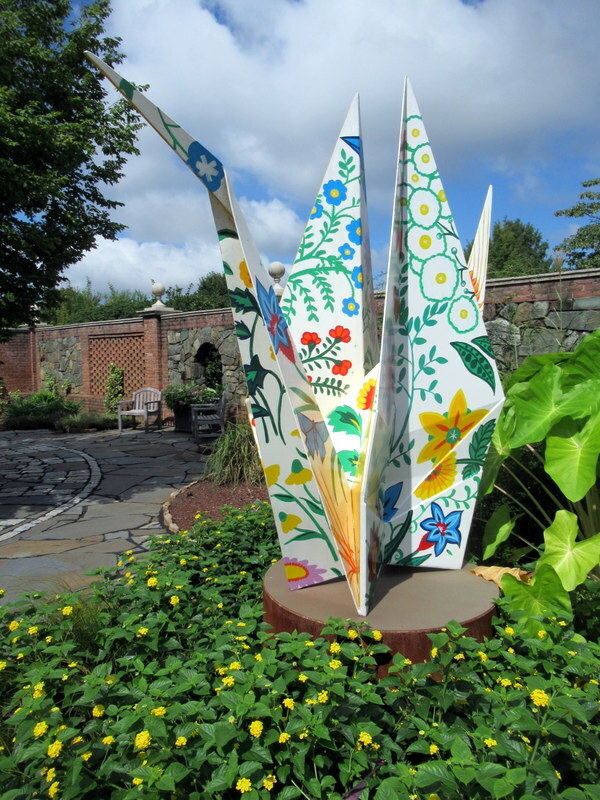 The show “Origami in the Garden” was fabulous, as were the flowers. Here’s a link and here are some of my photos. We continued on our trek north and stopped for gas. I searched for my wallet, fortunately I had a credit card and some cash stuffed in my pockets (a bad habit I have but as my friend IB says, it is what it is), I was glad this time! I realized I left it at a Wendy’s in Stony Creek, I called and of course they did not find it. So spent the next hour calling cc companies and cancelling cards. As the afternoon went on I realized I had other cards I needed to replace. Ugh. We arrived exhausted at our destination near Columbia, MD, took a sleeping aide, and slept all night not thinking about Florence at all (or trying not to). Of course the next morning we obsessed about Florence all day, not being able to take our eyes off the tv. Started working on a painting for my 2019 calendar. The painting I’m working on is the new “The Jarvis at 220” which is in my block, and the Pollock Street Pub & Oyster Bar also on my block. It turns out the Jarvis had water in the basement, the Pollock Street Pub & Oyster Bar, like my house, had water inside their first floor. Since I was so close to Philadelphia (120 miles) I decided to go to pick up my sculpture, the rabbit I made this summer. This is the first I’ve seen it since it was fired. On our way to Philadelphia we stopped to eat. I was on the phone with my sister telling her about the flooding, after I hung up this little old lady spoke up and said “You can come to my house – I live alone and I have lots of room!” People can be so kind. We stopped at the best Ceramic supply store I’ve ever been in at Norristown to pick up stuff. Even though I knew my pottery studio was flooded I knew I had work to make for people. If my electric is compromised I’ll see if I can have someone fire for me. It’s the ceramic shop, http://www.theceramicshop.com. Of course I can’t go to Philadelphia with out going to the Reading Terminal and eating at The Dutch Eating Place. It was a tradition for Michael and I every time we went to Philadelphia, wish he was there with me. We cruised South Street to look at Isiah’s mosiacs. Then started shopping for cleaning supplies to take home. We spent the weekend glued to the tv watching the aftermath of Florence and seeing horrible photos of what she had done to our town. I knew I had a lot of water in my house so at this point my biggest concern was that the house was secure, were my doors caved in? Were there walls caved in? I was able to connect with some people via Facebook and asked them to let me know. They did and the house was secure. This is one of the photos I was sent. I could see the high water mark on the wall, 4′ up. And that bench in the foreground weighs over 100 pounds, amazing how much power water has to move things. One of the things we hate when they talk about evacuation is that often you can’t get back, in your town the water might have receded but inland the water is just rising flooding the roads we need to take back in. We drove home on Monday and it was pretty spooky seeing the signs saying I-95 closed. We got off on 64 headed east, by the time we got to Washington we started seeing signs of hurricane damage. But we were able to drive right in. I’m trying to catch up on my writing about trips earlier this year. After my clay workshop in Doylestown I drove to Michigan to join my sisters at the church we grew up in for their 150th anniversary. I was glad I made the effort to get there. I saw lots of art, birds, family, and friends. I spent a few days with my niece at the U of M Biological Station where she works on the Piping Plover Project. This bird is on the federal endangered species list. In the mid 1980s there were only 16 nesting pairs in the Great Lakes Region. This year that number is at 76 pairs, due in no small part to the efforts of this project. My niece is one of many zoo keepers, students, and other volunteers from around the country that go to the Station each summer to assist in the hatching and raising Plover chicks that for one reason or the other have lost their parents. I was taken with the care that was given to these chicks! Their own outdoor area at the beach, at the lab, indoor and outdoor facilities, heat lamps if necessary and they are fed a varied diet several time a day. The people working with the birds do try to limit their exposure to humans so when it’s time for them to be released they want to go with the other birds. The three chicks that were there when I was were small for that late in the season. I asked what if they’re not ready to fly south when the others go, the answer was someone may fly them to the gulf coast. My niece said University of Minnesota Professor and Principle Investigator of the recovery effort Francie Cuthbert says the the Piping Plover is an umbrella species for beach ecosystems, protecting the plover also protects other species of fauna and flora that might otherwise be overlooked. You could almost see these chick change each day. I made a quick trip to the bridge, I haven’t seen it in many years. When sorting through my Mom’s papers I read that my grandfather, her dad, was one of the first people to drive over the Mackinaw Bridge when it opened. I can remember before it was built waiting for the ferry to take us to the UP. Then I was lucky to be at Little Twin Lake near Mancelona to observe the first Loon chicks on that lake in 15 years. It was fun watching the family and how fast they could cross the lake. Sometimes the 4 would be together and other times one parent and one chick. You probably know this but the loons claim a territory, usually 60-200 acres and will chase off any loon that tries to intrude upon their area. The loon call is haunting. It was a wonderful week of kayaking, bird watching and sailing. Of course the flowers were beautiful. I can’t go to northern lower Michigan without driving around the Lelanau Penninsula and visiting all the little towns and art galleries along the way. Had to get this new piece from one of my favorite Michigan artist. If you don’t live in Michigan you may not know that the west coast of the lower peninsula of Michigan is pretty much all sand dunes from Empire south. The largest and best known are the Sleeping Bear Sand Dunes. And Michigan has about 124 working lighthouses, at one time there were 247! Here are just a few of them. I made a quick trip to Saugatuck to see my friend Sandra, visiting art galleries and the Federik Meijer Gardens and Sculpture Park. Here the emphasis isn’t on flowers, although there are some beautiful ones, it’s on sculpture set in natural surroundings. We went to a Paula Poundstone performance at the Saugatuck Center for the Arts, she was so quick and so funny. They also had this amazing show of work by Michelle Stitzlein. 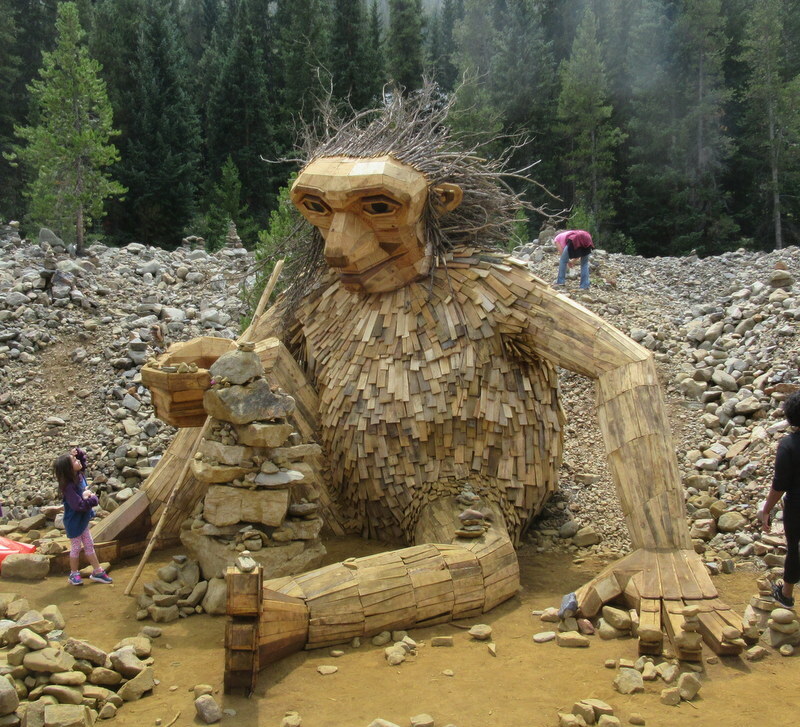 She creates art with recycles materials. Garden hoses make up a large portion of her work. My sisters, nieces, and I went to tea – something I’m not used to doing – and it was really neat. The name of the tea house is Sweet Shalom Tea Room and it’s in Sylvania, Ohio, a suburb of Toledo. They do formal teas on Fridays and Sundays, each month has a different theme with a menu reflecting the theme. When I think of going to a tea I think of tiny bites of something and one type of tea. Not at these teas, we got pots of 8 different teas and when we were finished with the food we were full! Everything is served on vintage dishes, vintage tea pots and they do a short program about the theme of the month. It was really nice. I got home from this trip just in time to visit Colorado for a week….. I kind of overbooked this year! But looking back I’m glad I did, not knowing what would come up later in September … Florence.